When it comes to basement waterproofing for your home Mares & Dow Construction has you covered. We cannot stress enough how important it is to keep your basement dry, safe, and healthy. Is Your Basement or Crawl Space Leaking? Water Seepage is rarely a one time event. Once water has seeped through your foundation, walls or floors, you can almost always be certain that it will happen again. Basement and crawl space water problems are very common in the San Francisco Bay Area. Water seepage in basements and crawl spaces is very common in new and old homes. Water can leak into a basement through all types of openings in the walls, floors and the joints where the walls and the floor join or concrete cracks. Mares & Dow Construction uses Grip-Tite Manufacturing Co. products. Grip-Tite products are Designed and Engineered to perform “The Very Best” waterproofing tasks. Exterior waterproofing is where it all starts. Exterior surface drainage is very important in the beginning . Which means the surface water around the house from rain, sprinklers etc. must be controlled by the ground surface and sloped to drain away for house. All of the roof gutter and downspout water must be directed away from the house.The most effective method to stop basement and crawl space water seepage is to install a full-perimeter “FRENCEH DRAIN” system. We provide different drainage systems for the many different types of drainage seepage problems in basements and crawl spaces. Waterproofing from inside the basement or crawl space is installing a system that will collect water that is entering and send it to a sealed sump pump system. We install different interior waterproofing systems depending on the water seepage or flooding of a basement or crawl space. Often times a sealed drainage system is required beneath concrete floors to remove the water that is causing cracks and water seepage into the basement. Combining sealed interior waterproofing, a drainage system and today’s pump system will guarantee to keep your basement or crawlspace dry and healthy. In order to protect against moisture or water passing through your floors and porous concrete walls , a wall vapor barrier or floor barrier should be installed. 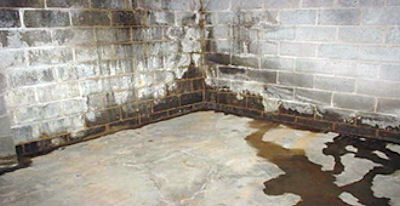 Crawl Space wall vapor barriers and floor barriers protect very good against moisture, water, mold and unwanted pests. Mares & Dow Construction along with Grip-Tite Manufacturing products uses the best engineered solutions to solve crawl space problems in the most cost-effective methods that are permanent. Basement wall and floor cracks are the number one causes for basement and crawl space water problems. Water in the soil builds up a pressure and over time the water finds a path into the basement or crawl space. This pressure is called hydrostatic pressure. In most cases once water seeps through your foundation, walls or floors, unfortunately you can almost always be certain it will continue to happen again.But fortunately there is a way to repair cracks. One way we recommend is the wet lay up method with the use of carbon fiber. The uni-directional carbon fabric produced form continuous tow carbon fiber provides several advantages in wall structural repair. It is economical, low profile repair appearance, affords the opportunity to be finished over or painted, adds significant structural integrity including crack repair and can be used in conjunction with crack injection. The most important fact to remember when performing crack repair is solving the source of the water seepage and controlling the water problem and permanently stopping the water seepage. At that point Mares & Dow construction will determine the best crack repair method and products. We use a pressure injection system with high quality Grip-Tite Manufacturing epoxy and polyurethane foam materials and sealants. Epoxy crack repair creates a concrete weld that becomes stronger than the concrete itself. This system of wall repair seals the crack and creates a seal of very high compressive strength. A Polyurethane crack repair is flexible and sometimes this is especially important if slight foundation movements are taking place. Our Grip-Tite polyurethane hydro sealant allows for up to 20% movement of crack and still seals. Polyurethane does not contain compressive strength. The real plus in polyurethane products is the sealant can be applied to active seepage cracks and seal up very quickly.